After writing about the power of human connection it was time to live it. If I recall all my life journeys I was happiest when freed from societal convention and exploring other realities. I was also happiest when I walked out of the whirling mechanics of my own mind and entered another’s. Though a writing group, I had heard mention of another woman writer that defied all norms of what a woman should do. Birgit was a German born motorcycle racer with a 2nd degree black belt in Taekwondo. She had traveled extensively, at times living out of her own car in pursuit of adventure. She gave up picket fences, domestic stability, and other prescribed sensibilities in order to maximize every square inch of her life. To me, Birgit’s life was one that a legend could be born of. I got in touch with Birgit and asked if she would be willing to interview. She heartily agreed and we met up in a crowded Starbucks to talk non-convention. A tall woman in a leather jacket eagerly found me among the caffeine needy. Birgit had far more energy than her 50 years suggested. We easily started talking, beginning with Birgit’s early affinity for motorcycles. Birgit said, “I first fell in love with motorcycles at age three when my father used to take me around the streets of Stuttgart on his moped.” She told me that she couldn’t wait until she was big enough to ride on her own. During her teen years she hung out with the biker crew, just waiting for the day she turned 18 and was allowed to ride her own full size bike. She remembered it with a nostalgia typically reserved for a first love. “It was a Honda 750,” she said dreamily. Much to her parents confusion she refused a normal life “with respectable furniture and coffee klatches.” She instead chose to race her bike in select race tracks across Germany, accepting the injuries that went along with the rush. A motorcycle accident may break a bone, but a desk job would have killed her. Birgit mentioned she didn’t want her script in life edited for her according to commonplace values. She wanted to chart her own life path; a path that was wild, free-spirited, and with with no specific destination. 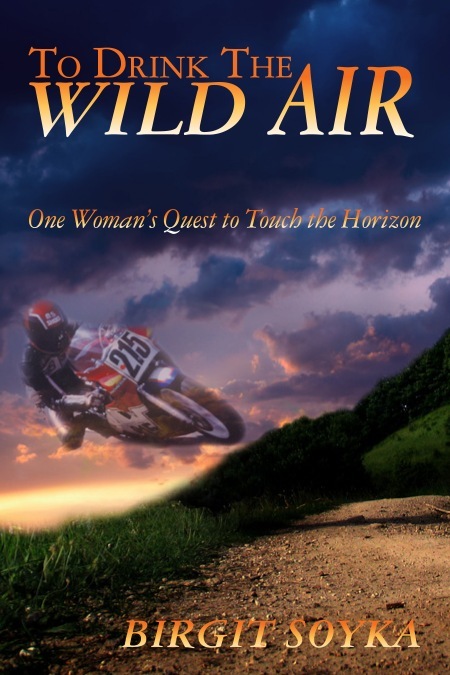 Birgit used all her reserve cash to support motorcycle racing. She was the only female to race in one of the Southern California Racing Clubs﻿. “It was such an ego-driven, male dominated sport,” she said. But gender didn’t stop her. In 1986 she won the club championship. She was 26 years old. Her attitude paid off. After her racing achievements, including placement in the Yamaha cup in Germany and multiple wins in the US, Birgit finally landed sponsors and a racing team. The days of living out of her car were over. Leaving the US proved to be detrimental. When she tried to come back after the operation, she was caught by immigration as an illegal. Birgit was sent to jail for ten days, and then back to Germany for a full year. Birgit’s next opportunity was an amazing position with her company in Zurich, Switzerland. She and Ralph moved there. However, after suffering a harsh winter, Ralph promptly packed his bags and moved back to Los Angeles, abandoning Birgit. “He took his crap and left me with a job, a full apartment, and a car because he was unhappy in the cold winter.” Birgit was left with a decision to make. After recovering from heartbreak that came with the divorce, Birgit felt the call of adventure again and moved to Mexico for her job. “This was the start of a spiritual transformation,” Birgit said, remembering Mexico fondly. “Mexico was hard but also one of the happiest times of my life. Sure, I was robbed and kidnapped. Every week something was stolen from my car antenna to my gym bag. But I was happy.” Birgit claims her happiness was due to two things that had nothing to do with materialistic pursuits. The first was the rigorous discipline of Taekwondo. “Since I was too tall for the other girls, I was paired to spar with the guys. But I was used to that from my days with motorcycles.” Birgit ‘trained like a horse’ for 2-3 hours a day, competed in tournaments, wrote a dissertation and received a second degree black belt by the time she was forty, proving that age is never a barrier to accomplishment or growth. Human connection had never felt so good. Of course as we left the café we still agreed to friend each other on Facebook. I suppose social media will always have a place, even with the wild haired motorcycle racers! For those that want to read more of Birgit’s story, you may find her recently released book, To Drink to the Wild Air, online at amazon.com. Great post my friend and thanks for sharing a brave woman’s story. I can truly relate to her and her life with me being 50. I have lived out of suitcases myself and divorce has claimed my heart also but the desire to perservere is truly the key to a happy life! Oh by the way, I like what you stated about meeting in person…….